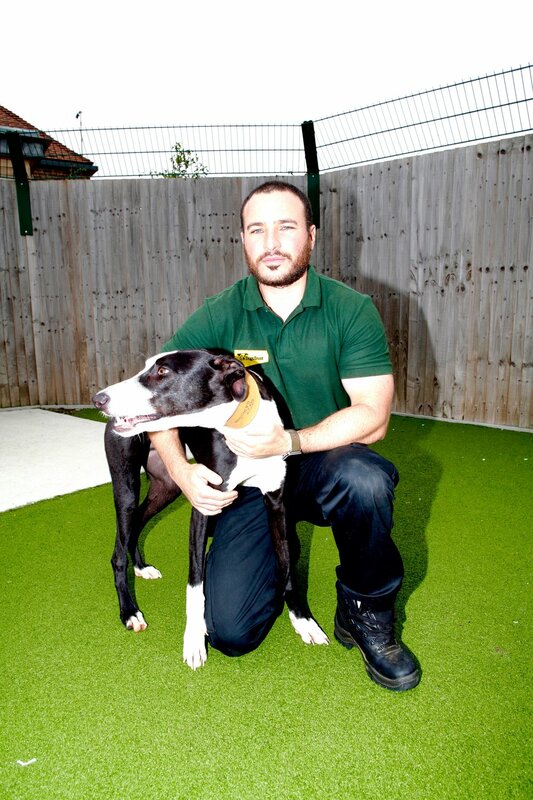 On work: My job is to support the Training and Behaviour Advisor in ensuring all of the dogs at Dogs Trust, Basildon have their behavioural needs met; this includes lots of positive training and one-to-one time with the dogs. I have been in my role for about 10 months, before this I worked as a Canine Trainer with Dogs Trust. My favourite part is when a dog who has come to us with some challenging behaviours and we have been able to help them overcome this and find them their forever homes. One thing she asks perspective owners: I think it is important to ask what they want from a dog and how it will fit into their lifestyle as this helps us to match the perfect dog with them. On her own dogs: I have two dogs from Dogs Trust, Buddy is a Staffordshire Terrier crossed with a French Bulldog and Dexter is a French Bulldog. They arrived at Dogs Trust Basildon a year apart they were both 11 months old. We are Buddy’s fourth home and Dexter came in very underweight and under socialised with other dogs. They’ve become best buddies though and love each other and we love them very much. On Saffiki: Saffiki, or Fiki as we call her, is a cuddle monster; she also thinks she is a lap dog despite being around 40kg. She is very affectionate and is great fun to be around. She is a firm favourite with all of the staff. Excitingly she is hopefully heading off to her new home very soon; we’re all so happy and excited for her. On career plan B: No, I cannot imagine doing anything other than working with dogs, I am really proud to work for Dogs Trust and love doing what I do. On work: My job (as adoption advisor) is primarily front of house: talking to customers to arranging the adoptions. This is my first month in this role, as previously I was a canine carer for 3 and half years. As part of that role though there was a significant proportion of time dedicated to the role of adoption advisor, so I knew I would love focusing solely on this side of the job. Favourite things about the job include: meeting new dog owners, chatting dog with them, seeing the dogs go home, sending the customers home happy. One thing he asks perspective owners: I always say choose your dog wisely as this can affect the experience deeply. Choosing the right dog at the right time is very important for the owners and the dog. Do you have a dog: Not at the moment as I lead a busy life and am not home very much. I also have a two and half year old son so will wait until he is a bit older and my life is more settled before I get a dog. See above re my own ‘words of wisdom’ about choosing wisely. On Fletcher: In my four years of working with dogs, Fletcher is the most friendly I have met. He will actively seek out new people on walks and wag his tail and say hello. It is a very unusual trait to see this behaviour in such an extreme. Fletcher finds meeting new people very reinforcing and we often walk him through reception as a treat to meet everyone. He came from a litter of Lurchers who were all really friendly and whilst his mother and siblings were adopted, Fletcher is still waiting for his forever home. On career plan B: I worked in banking for 16 years before moving into canine welfare. This new career will take me into retirement. On work: I work as a receptionist which involves meeting lots of lovely families who are willing to give one of our dogs a second chance at finding a loving home. A lot of my job also involves admin work and making sure that the paperwork associated with the adoption process is completed before the dogs go home. I love the team spirit in my job; everyone who works here is really committed to finding new homes for our dogs. One thing she tells perspective owners: Keep an open mind as the perfect dog may be waiting for you, but may not be the breed you were looking for! On her own dogs: I have always had Collies. Both of my dogs are quite old now, but in the future we really hope we can adopt one of the dogs in the centre. On Henrik: Henrik is an absolute sweetheart, he is full of energy and is very cheeky, he greets everyone he meets with a waggy tail and a wriggly body! On career plan B: I have always wanted to work with animals and started with Dogs Trust as a volunteer when they first opened in Basildon nearly two and a half years ago. On work: I am new to the role of Deputy Rehoming Centre Manager as I was appointed it two months ago. Currently my main duties are to oversee the adoption of the dogs in the rehoming centre and ensure our adoption advisors are doing everything they can to ensure our lovely dogs find their ‘pawfect’ matches! So this will include looking at new, innovative ways to promote our dogs using social media and vloggers etc. Previous to this role, I was an adoption advisor and am proud to have been involved in the responsible adoption of 2,000 dogs since we opened in June 2014. One thing she tells perspective owners: You’ve come to the right place! On her own dog: I have a four year old chocolate Labrador called Bella, who I have had since a puppy. When I was younger, I was very fearful around dogs and having Bella ultimately helped me overcome my fears and find a love for dogs that I never thought I would have. I became very passionate therefore, about animal welfare which has led me to working for Dogs Trust. On Penny: Well, Penny is a chocolate Labrador, so she’s amazing but clearly I’m biased because of my own Bella! Penny, like most Labs, is very food driven so will quite happily do anything for a treat or 10!! She has a lovely nature and has a close friendship with her pal Charley and they have now been rehomed together, so this story has a very lovely happy ending! On career plan B: As a child, I desperately wanted to be an actress and often dreamt of being on EastEnders, sadly it was not to be and I finally found my real passion 20 odd years after leaving school but better late than never! Find your new pooch, and learn more about Dogs Trust, here.